The successful Knowledge of London advertising campaign is set to continue running as trade groups and companies unite to fund a further month. The London Taxi PR originally teamed up with 8 outdoor media who provided 29 large format digital billboards across Central London. 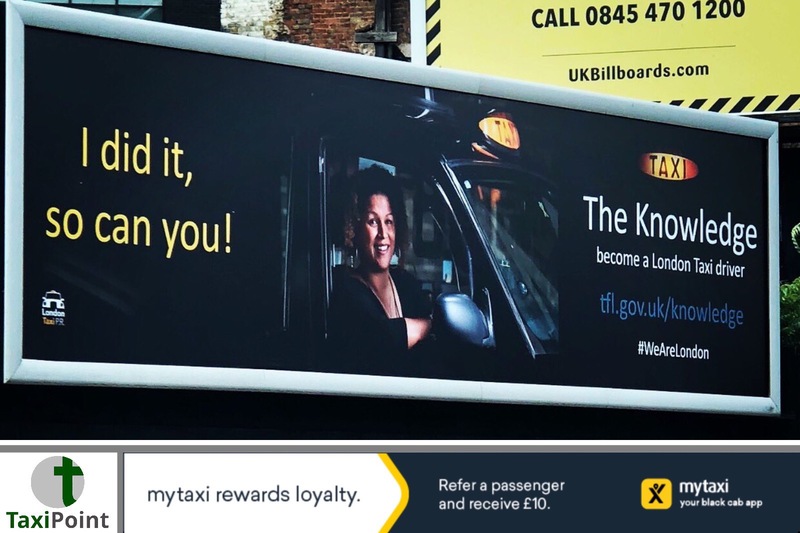 The campaign features London Taxi drivers of all genders and ethnic origin, which reflect the current diversity within the trade, with the headline “I did it, so can you”.With the campaign set to end soon, several taxi industry names stepped forward to keep the advertisements running. Donations from the LTDA (£2,000), Plan Insurance (£500), LCDC (£250) and Colts Cabs (£250) respectively, helped secure the space for the following month. However committed monthly funding from drivers and firms like Ascotts, CabVision, Sherbet London and the UCG will bring longer term benefits too. All images used in the PR campaign have been provided by Terry Gibbins, a passionate and proud London Taxi driver and Photographer, who has been photographing drivers for several months. A recent spike in students interested in becoming London taxi drivers, especially from those who were female, was linked back to the recent campaign. Dean Warrington, who has been running Wizann Knowledge School since 1996, said via Twitter earlier this month “Who said advertising doesn’t work? As soon as London Taxi PR start their campaign we see an influx of women starting The Knowledge with 4 women in our beginners seminar today!”A spokesperson from London Taxi PR said: “The aim of the campaign is to encourage more people to sign up to do ‘The Knowledge’ and become a London Taxi driver. We believe the job offers great opportunities for all who are prepared to put in the work and meet the high standards required of the profession to be a licensed London Taxi driver.”All of London Taxi PR’s campaigns and publicity has so far been been funded by fellow London Taxi drivers, many of whom have signed up to donate to the cause on a monthly basis, indicating how passionate they all are about their industry and the cause.